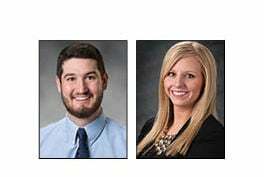 Physician Assistant Cody LeMay, left, and development associate Meagan Avery. Physician Assistant Cody LeMay has joined St. Luke’s Orthopedics and Sports Medicine. LeMay received his Master of Science in Physician Assistant Studies at Massachusetts College of Pharmacy and Health Sciences in Manchester, NH. He is board certified by the National Commission on Certification of Physician Assistants. Meagan Avery has joined St. Luke’s Foundation as development associate. Avery has worked as a recruiter for St. Luke’s since October of 2016. She received her Bachelor’s Degree in Business Administration and Marketing from the University of Wisconsin-Superior. She also completed the Leadership Duluth program in 2014. Avery focuses on connecting individuals to opportunities and community impact through philanthropy and volunteerism.